The Charity was formed in November 2003, and In the first few years, we started to find our way, and develop our systems. Serious fundraising only began in 2007, as we became more widely known, and applications began to increase rapidly. This is shown in the first graph below. As the years have progressed, this growth has continued, constantly presenting us with new fundraising challenges. We make no predictions about where we might be going next, everything depends on our supporters, the funds raised, and the extent of applications for help we receive that comply with our grant criteria. Please see our Grant Applications page. 2016 was an exceptionally busy year, with activity up 56% on 2015, and we completed 90 grants totalling £136,323. 2017 was again busy with a further increase in grants made to 102, totalling £137,187. 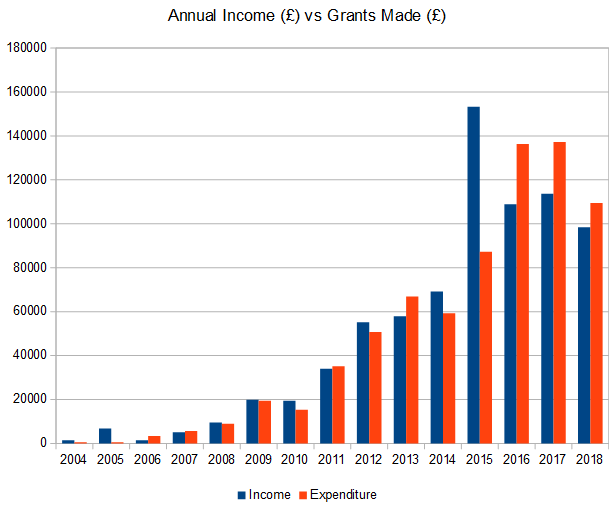 In 2018 the number of grants reduced to 88, and we granted £109,438, although timing played a part as we were aware of several applications in preparation, and two where co-funding was being investigated by the applicants due to the high cost of the equipment required. With total funds raised just below our target of £100,000, the reserves ended the year at £18,099, and we expect several donations to come in during early January. We completed 2018 having made 600 grants since we started in November 2003, and £736,120 granted. We hope to reach our next milestone of £750,000 granted in Q1.